Having completed the preceding review of the Book of Mormon, in respect to its system of theology, it is believed to be advisable before laying the volume aside to give a measure of attention to its geography. To begin with the beginning would require that the geography of the Book of Ether should receive the earliest treatment, for the reason that this portion of the volume was likely composed before any other portion. In addition to the proofs of the correctness of that position which were given on a preceding page, may also be cited the fact that the contents of the Book of Ether are several times referred to in a way to suggest that the author had them under his hand during the composition of the Book of Mormon. For example the fate of the Jaredite population as described in the Book of Ether is indicated in the Book of Jacob 5:44. This last citation stands at some distance in advance of Mosiah 8:9-10 where the earliest direct reference to the 24 plates of gold upon which were engraved the contents of the Book of Ether, is found. That degree of information concerning the Jaredites would have been highly singular unless the writer had obtained access to the plates before they were discovered by the servants of king Limhi. sort, at least in the existing order of the books that occurs in the Book of Mormon, was likely drawn from Ether 15:15. Attention is also (directed) to the fact that the Book of Alma (ch.37) supplies a good many references to the prejudices against the institution of Masonry which are displayed in the 8th chapter of the Book of Ether. If specifications are important, it may be mentioned that Alma 37:27 contains a direct allusion to the vulgar conceit that Masonic signs and oaths were derived from Cain the first murderer, which is so freely aired at Ether 8:15-18). 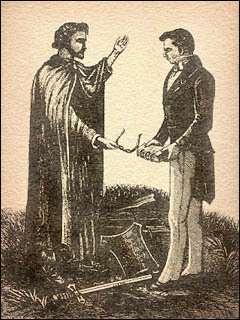 This latest reason is conveyed in the following terms, which are understood to express an allusion to the disclosure of the Masonic ritual which had been recently given to the public by William Morgan: "And now I, Moroni, do not write the manner of their oaths and combinations, for it hath been made known unto me that they are had among all people, and they are had among the Lamanites (Ether 8:20). The prophecy delivered to Coriantumr (Ether 13:21), signifying the advent of another people to inherit the land, who should bestow the rites of burial upon Coriantumr himself is too nicely fulfilled at Omni 1:21 to admit of any other supposition than the author had the Book of Ether before his eyes when he was composing the Book of Omni. For the sake of considerations like the above it must (be) allowed that the Book of Ether preceded in the order of time the production of any portion of the volume with which it has been bound up. Hence its geography requires to be considered apart and in advance of the geography of the Book of Mormon. with certain other dependents to the number of twenty-two (Ether 6:16), were the first, according to this narrative, to behold these shores. They came direct from the confusion of speech at the Tower of Babel and after a tedious passage of 344 days (Ether 6:11) in eight barges of singular construction, they are said to have debarked on the coast of the present Republic of Mexico, at a point of it, as may be conceived, which lay somewhere near the latitude of the city of Mexico. At least this is the suggestion of Mr. Orson Pratt in a footnote appended to Ether 6:12. The region adjacent to this landing place is designated as the land of their first inheritance (Ether 7:16). This "land of their first inheritance" was christened the "land of Moron, where the king dwelt" (Ether 7:17 and 7:6). The boundaries of this "land of Moron" was drawn at the same place as the southern boundary of the domain of Mexico is now drawn. It is not likely that the author of the work understood the domain of the king who dwelt in Moron to extend all the way from the Pacific Ocean to the Gulf of Mexico, since mention is made of the land of Nehor (Ether 7:4), otherwise known as the land of Corihor (Ether 14:27), which is believed to have been situated by him some where to the south east of Moron. The same remark applies to the kingdom of Cohor (Ether 7:20), which seems to have been originally a section of the Land of Moron, that was temporally drawn away by the care and ambition of Cohor. The reason for the conclusion just now stated that the southern boundary of the land of Moron was the same as the southern boundary of the present Republic of Mexico is supplied (in) the fact that the "land which is called Desolation by the Nephites" extended from that line (to) the Isthmus of Panama. That it extended to the Isthmus of Panama is proven by Alma 22:30-32 and by Mormon 3:6: that this country extended no farther towards the north than the line of the land Moron is indicated by Ether 7:8. Therefore according to the notes supplied by the Book of Ether, there were only two main political divisions among the Jaredites in North America, the one being the land of Moron and the other being the land of Desolation. Moron embraced a considerable portion of the territory of the existing Republic of Mexico lying south of the 30th parallel of latitude, and Desolation embraced all that portion of the country lying between the northern boundary of Central America and the Isthmus of Panama. By the above representation it will appear that the course of the empire among the Jaredites was steadily southwards. They are reported to have builded "a great city" at the Isthmus (Ether 10:20), which is supposed to be the same as the "city of Desolation" mentioned at Mormon 3:7; and to have made a sort of hunting ground of South America (Ether 10:19-21). In a stress of famine the whole nation was driven in that direction and a remnant of them actually took refuge in South America (Ether 9:32), who may be supposed to have been the first to look upon the land to which the Nephites afterward gave the name of Zarahemla (Ether 9:31). The Book of Ether supplies only a single allusion which can with any sort of propriety be supposed to refer to that portion of North America which lies to the north of the 30th parallel of latitude. At 10:22 it is said: "And they did preserve the land southward for a wilderness to get game. And the whole face of the land northward was covered with inhabitants." In case the suggestion of Mr. Pratt should be conceded to the effect that the phrase "land northward" contemplates the whole face of North America, it is only a single flash of light which but serves to make the darkness visible. The author of the Book of Mormon is believed to have been passably acquainted with the history of the Indian populations of Mexico and Peru and to have possessed only vague general information touching the extensive races of the Algonquin and Iroquois stock who inhabited the present territory of the United States. For the rest the efforts of Pratt to transfer some of the scenes of Jaredite history to the northern portion of the State of New York has failed in every point. One of these points is supplied by Ether 9:3: "And the Lord warned Omer in a dream that he should depart out of the land; wherefore Omer departed out of the land with his family, and traveled many days, and came over and passed by the hill of Shim and came over by the place where the Nephites were destroyed, and from thence eastward, and came to a place which was called Ablom, by the seashore, and there he pitched his tent." by Mr. Pratt it is suggested that "Ablom by the sea shore" was "probably on the shore of the New England States", but this view is every way inadmissible. The coast of New England was much too far from the scene of the action; Omer in departing from the land of Moron over which he ruled is conceived to have gone into the land of Desolation, since the general course of the Jaredites was towards the south. On his journey he passed the spot where after the lapse of many ages the Nephites were subsequently destroyed; but this spot was not far distant from the Isthmus, because it is recorded that after "the great and tremendous battle at Cumorah" where the Nephites were overthrown, some of them escaped into South America in order to rescue their lives (Mormon 6:15). It is therefore, highly probable that in passing the place where the Nephites were destroyed Omer was traveling in the land of Desolation and that the writer of the Book of Mormon understood that the place Ablom was by the seashore on the eastern coast of Nicaragua or Costa Rica. Mr. Pratt is also just as wide astray in the opinion that "the waters of Ripliancum" where one of the battles between contending Jaredite forces occurred were Lake Ontario (Ether 15:8 note). By this violent conclusion he removes the conflict and destruction of the Jaredites more than fifteen hundred miles from the borders of the land of Desolation, which was so named for the express reason that within its borders had occurred this conflict and destruction. On the contrary it is every way more reasonable to conclude that the "waters of Ripliancum" were Like Nicaragua. The name Ripliancum is interpreted to signify "large or to exceed all". and Lake Nicaragua meets the description by exceeding in size every inland body of water in that portion of the country. The position of the "waters of Ripliancum" becomes a question of importance when it is brought to mind that south of it (Ether 15:10), was the hill Rama, where according to the authority of Moroni, his "father Mormon did hide up the records unto the Lord which were sacred" (Ether 15:11). Mr. Orson Pratt in a footnote appended to this passage says that "Ramah was the hill Cumorah"; but that is conceived to be a violent assumption. It is much more likely that here exists a plain contradiction of the statement given out at Mormon 6:6 where the prophet of that name expressly says that he "hid up" the precious memorials not in the hill Ramah, but in the hill Cumorah. It is decidedly more reasonable to regard the business as a lapse of memory on the part of Mr. Rigdon, than to solve the difficulty by the arbitrary method which Mr. Pratt suggests. advanced by Mr. Pratt in connection with Mormon 6:2 to the effect that "the hill Cumorah is in Manchester, Ontario Co., N. York", is not rightly supported by anything in the Book of Mormon; it was born of the necessities of Joseph who unwisely professed to have discovered the "plates" in that portion of the world. The Book of Mormon speaks against it and in favor of the region adjoining the Isthmus of Panama; it would have been a finer story if Mr. Smith had signified that the angel who served him had procured them from the locality where the volume distinctly indicates they were concealed, and brought them to him in Manchester, New York. If the Mormon people could be induced to investigate the facts of this clumsy business, there is ground to anticipate that the faith of numbers of them would suffer shipwreck on the "hill Cumorah in Manchester, Ontario Co., N. York." It will not be of any assistance if they cite the fact that the district where the hill of Cumorah was fabled to be situated was "a land of many waters, rivers and fountains" (Mormon 6:4),: since that description suits the territory adjacent to the Isthmus as accurately as the region about Manchester. There can be little hesitation in pronouncing that Joseph committed a blunder, which neither can be "hidden up" nor forgiven when he transferred Cumorah from its rightful place in the extreme south, to an impossible location in New York. While the nation who were fabled to have derived their origin from Jared and his nameless brother were employed in the task of effecting their own destruction by means of civil strife, another party of adventurers from the ancient continent were making their way towards the American "promised land" under the leading of Lehi of Jerusalem. The first migration had kept the land, if the ordinary chronology may be trusted for a period of 1600 years; the time of their end was at hand. The second company departed from Jerusalem in the year six hundred before Christ and are supposed to have sighted these shores eleven years later, after a series of embarrassments and hardships, which could have been surmounted by nothing else than supernatural counsel and support. Just about the time of their landing another party under the direction and command of Mulek, who was no less a personage than a son of king Zedekiah (Helaman 8:21), just now carried away by the king of Babylon, turned their steps from Jerusalem to America. inspiration of the prophet might have been a trifle at fault in that instance. It is, perhaps, more likely that the writer of the Book of Mormon conceived Lehi and his company to have founded their first home somewhere in the limits of Peru. The itinerary hints that are scattered here and there (and does) not clearly indicate so remote a position as Chili. On the other hand the company of Mulek first debarked in the land of Desolation (Alma 22:30). In complement to this fact, North America was given the title of the "Land of Mulek" while South America was designated as the "Land of Lehi" (Helaman 6:10). In the land of Desolation, it was not long before the followers of Mulek discovered Coriantumr, the king and warrior, and the last survivor of the old and powerful stock of the Jaredites, who "dwelt with them for the space of nine moons" (Omni 1:21), at the end of which it is possible he received at their hands the burial which had been predicted by the prophet Ether (13:21). Out of some unexplained discontent with the land of Desolation, the Mulekites made their way southwards through the whole length of the Isthmus of Panama, and established a temporary home in the land Bountiful, which lay just beyond the Isthmus (Alma 22:32) In the course of time and experience, however, they found important to migrate still further towards the south. When they were first encountered by the Nephites they were dwelling in the land of Zarahemla (Omni 13-16), Where they were shortly absorbed by the Nephites and received the Nephite king Mosiah I as their sovereign, displacing thereby the apparently excellent king Zarahemla a descendant of Mulek (Mosiah 25:2), who had hitherto been named as their ruler (Omni 1:19). The movements of the sons of Lehi, who speedily came to be designated by the name of Nephites, are of more consequence. Though Nephi was given out to be a person of uncommon vigor, he had upon him the blight of sincere piety. Fear and service of Jehovah was seldom really of advantage to a man's worldly affairs among these peculiar people; the wicked Lamanites nearly always contrived to bring away the lion's share of divine blessings and protection. These held the land of their first inheritance, while Nephi and his people were constrained to take to the wilderness, where after a "journey of many days", they pitched their tents, and settled a new land which was ever afterwards designated as the land of Nephi (2 Nephi 5:8). This first movement is supposed from a number of subsequent references to the land of Nephi, to have been in a northerly direction. In the course of no very long time the ungodly Lamanites had grown so rapidly beyond the godly Nephites as to render a second removal indispensable. It was undertaken and executed by the conduct and inspiration of Mosiah, the first of the name (Omni 1:13) who carried them still farther northward to the land of Zarahemla, where as before described they discovered the people of Mulek (Omni 1:14). Henceforth and almost quite down to the extinction of the Nephites, the land of Zarahemla remains one of the most important scenes of Nephite history and power. According to the earliest intimations that are supplied regarding its situation, Zarahemla is understood to have been a district of country situated on the western shore of the river "Sidon", which upon the authority of Mr. Orson Pratt (Alma 3:15 note) is "supposed to be the River Magdalena". The reason for placing it upon the western instead of the eastern shore of this river is found at Alma 6:6. At first the territory of Zarahemla was conceived of as being bounded on the east by the River Sidon (Alma 2:15), on the west and north by the wilderness of Hermounts (Alma 2:36-37), and on the south by the land of Minon (Alma 2:24). Subsequently, however it was very much enlarged. According to the representation of the latter portion of the Book of Alma, the land of Zarahemla extended quite across the continent of South America, embracing for the most part all the territory that lay north of a certain belt of wilderness which separated it from the land of Nephi, which had now been long possessed and inhabited by the Lamanites (Alma 50:7-11). A number of cities, as Lehi, Moroni, Aaron and Nephihah (Alma 50:11-15), were founded on the Atlantic coast within the limits of Zarahemla. The certain belt of Wilderness which separated the kingdom of Zarahemla from the land of Nephi, is given out to have extended quite across the continent furnishing a sort of barrier against Lamanite invasions from the south (Alma 22:27). nation they were constantly employed in the amusement of harrying their righteous brethren of the north, and prosecuted numberless wars in which the balance of advantage too often remained with the enemies of religion. At length the pious Nephites began the work of colonizing North America; it would form a sort of relief against the pressure of their enemies to escape from the continent, where these perpetrated so many abominations and triumphs. The first movement of this kind is mentioned at Alma 63:4. Once begun, the migration in the direction of North America appears to have become immediately popular and other enterprises of colonization followed in swift succession (Alma 63:7-9 & Helaman 3:3-4). No sufficient period for the accomplishment of a feat of this magnitude had transpired until the Nephitepopulation is represented as being spread over the whole of North America (Helaman 3:5-8). This act of foresightwas highly rewarded, for no sooner had the Nephites acquired a sure footing in North America, than the wicked but always divinely favored Lamanites, pressed them out of their ancient seat in Zarahemla into the land Bountiful, a region which lay just northwards between Zarahemla and the Isthmus of Panama (Helaman 4 :5-6). were ever again compelled to yield before the children of iniquity, and they seem to have been cooped up in the land Bountiful at the period when Jesus manifested his person unto them (3 Nephi 11:1). Dating from this event there was a protracted lull of 277 years described in the Fourth Book of Nephi in which existed a general sentiment of religion and good fellowship both among the Nephites and the Lamanites. This came to an end with the beginning of the "great apostasy" a short season prior to the rise of the prophet and general who is so well known by the name of Mormon. Then began a fresh series of conflicts, which compared with any that had preceded them, might with every degree of propriety be designated as short and sharp. Hostilities were first opened in the land of Zarahemla, (Mormon 1:10-11), which meantime had fallen once again to the hands of the Nephites, (Mormon 1:10-11). They were shortly afterwards by the terror of the Lamanite arms driven forth in the direction of the Isthmus (Mormon 2:3); but fetching a halt at the city of Angola, they there defended themselves without success (Mormon 2:4). Ill fortune of the same sort awaited them in the land of David and also in the land of Joshua, both of which apparently were situated in South America (Mormon 2:5-6). America. The hill of Shim is mentioned in the fabulous account of the wanderings of king Omer in the land of Desolation (Ether 9:3), and could by no possibility be expected elsewhere than on the shores of the northern continents. By a sudden turn of affairs the Lamanites were now driven out of North America (Mormon 2:27), and a treaty was affected by the conditions of which they should henceforth confine themselves to South America, while the Nephites should peacefully inhabit North America (Mormon 2:29). By means of that arrangement peace was kept for the space of ten years (Mormon 3:1). At the close of this brief respite and of the year 360 of the Lord's grace, another and the last general conflagration was started (Mormon 3:4). The prophet and captain who had so long stood at the head of their affairs now collected the Nephite people "at the land of Desolation, to a city which was in the borders by the narrow pass which led into the land southwards" (Mormon 3:5). This was the city of Desolation (Mormon 3:7), and here without long tarrying, the wicked and warlike Lamanites joined battle with their brethren. The result of the debate was for the moment favorable to the Nephites, and, elated by their triumph, they resolved to attack their enemies in their own country of South America (Mormon 4:1). unhappy Nephites retired to the city of Teancum which "lay in the borders by the seashore; and it was near the city of Desolation" (Mormon 4:3). In the course of the year 365 they repulsed the Lamanites and again entered the city of Desolation (Mormon 4:8), but not for long; the Lamanites rallied to the struggle and shortly were masters both of the city of Desolation and the city of Teancum (Mormon 4:13-14). This amount of detail will serve the purpose of showing that the conflicts between the Lamanites and Nephites which fell out to the destruction of the latter people were not waged as Mr. Joseph Smith and the Mormons represent, in the bounds of the existing state of New York, but rather within the limits of the land of Desolation, and quite near to the Isthmus of Panama. Still further to support this conclusion may be instanced the struggle which befell in the year 375; the Lamanites in that year captured the city of Desolation once again, and drove their opponents to the city of Boaz, which in its turn was also captured (Mormon 4:19-31). This place was in the vicinity of the hill Shim, which it has been previously signified was the place where the "records" were wont to be concealed. Mormon recovered them there (4:23), and prepared anew to defend his people who had now taken refuge in the city of Jordan (5:1-3). At the closing scene it is related that Mormon shortly after the year 380 collected all the Nephite people, for a decisive battle, to the "land of Cumorah, by a hill which was called Cumorah." (Mormon 6:2). The great battle of Cumorah was fought in the year 285 (Mormon 6:5) among the "many waters, rivers and fountains" which are reported by most travelers to abound in the extreme southern portion of the continent. Here all the Nephites were destroyed except four and twenty who were with Mormon, and also "a few who had escaped into the South Countries" (Mormon 6:15). Since all the facts of the relation tend to show that the battle of Cumorah was delivered in the vicinity of the Isthmus, and by consequence that the hill of Cumorah is situated in that region, it requires more than the unsupported affirmation of Mr. Joseph Smith and his adherents to take up the hill Cumorah by the roots and remove it to Manchester, Ontario Co. New York. It was a pure calamity to their cause that such a violent proceeding was undertaken directly in the teeth of the statements of the Book of Mormon. As the mountain could not come to Mohammed, it would have been the [better] part of wisdom for Mohammed to go to the mountain. Source of the History and Geography of the Book of Mormon. The volume professes to supply a record of the fortunes of three several migrations. Of these the first were the Jaredites who came from the dispersion of the nations at the Tower of Babel and settled within the limits of the present republic of Mexico. These worked their way southwards to the Isthmus of Panama, and finally completed their own destruction in the land of Desolation. The second migration, which appeared about 1600 years later were the family of Lehi, who came from Jerusalem and settled in Peru. These gradually worked their way to the North. The Nephite portion of them, who cultivated the worship of Jehovah with considerable assiduity, and were highly enlightened in respect to the tenets of Christianity, met their destruction also in the aforesaid land of Desolation, in the year 385 of our present era. The blasphemous Lamanite division were enabled to withstand the shocks of the "great apostasy" and the wrath of God on that account, and they still manage to maintain themselves in respectable numbers. but shortly made their way southwards across the Isthmus, into the South American country of Zarahemla, where they were encountered and observed by the Nephites in their progress northwards. After this event they lose their identity, and fail to maintain a separate existence and history. It is conceived that they (went) down with the Nephites at the extinction of the latter nation in the battle of Cumorah. According to the above survey the entire history and geography of the volume are comprised between the latitude of Peru on the one hand and the latitude of Mexico on the other. Of the larger political divisions that are named, the land of Moron lying somewhere about the latitude of Mexico city, is the most northerly. Next to it on the south lies the land of Desolation, extending all the way to the Isthmus of Panama. In South America the land Bountiful is first encountered, being situated just south of the Isthmus. Passing beyond it the land of Zarahemla appears, like the land Bountiful stretching from sea to sea, at least in the later period (Alma 50:9), when a number of its important cities were fabled to lie on the Atlantic coast. South of Zarahemla was situated what was designated as the "south wilderness", which also extended across the whole country. Pacific coast, this passage displaying the author's ignorance of the inhabitants of the Atlantic coast rather than any definite knowledge he possessed regarding them. Still below the land of Nephi was the land of Lehi, or the scene of their first landing, which it has been remarked was retained by the Lamanites. From that point to the strait of Magellan, the record supplied by the Book of Mormon is almost silent. It consists in nothing else than several assertions like the following, which represent that the whole of both continents were inhabited: "And it came to pass that to the land northward (North America), and did spread insomuch that they began to cover the face of the whole earth, from the sea south to the sea north, from the sea west to the sea east (Helaman 3:6). Similar statements of a general character may be read at 3 Nephi 1:17 & 4:23, but they are believed to indicate nothing more than that the writer of the Book of Mormon, having no definite information touching the aboriginal population to the north of Mexico or to the south of Peru, employed this vague style of reference to cover up his ignorance. With these facts in mind it becomes a question worthy of research to determine in what quarters Mr. Spaulding, when he was concocting his forgery regarding the American Indians, sought for information and materials. After much reflection upon the conditions of the case as the same have been just now laid down, and many exertions to trace Mr. Spaulding to his hiding place, I was made aware, by the happy accident of attending, to hear a lecture in which he undertook to decipher and interpret some of the inscriptions of Palenque, of the extraordinary skill and information of my kind and learned friend, the late Hon. John Mason Brown, in the department of American archaeology. When he had duly considered the facts that were placed before him, his admirable knowledge of the literature of the topic suggested the propriety of comparing the results obtained from the Book of Mormon, with the sterling and splendid "History of America, by William Robertson D.D., Principal of the University of Edinburgh." It was possible that the author of the historical portion of the work might have had these volumes before him at the time when he was elaborating his performance. It is believed that a minute examination of Robertson's pages will convince the mind of the student that the above was an admirable suggestion. The first edition of the "History of America" was sent forth during the progress of the American struggle against the Mother Country (Preface to the tenth English edition, p.i). It consisted of only three volumes (Preface, p.ii). These embraced a record of nothing except the history of Spanish America; the learned author proposing to reserve his account of English America until the close of the conflict that was at the moment in progress, so also the history of Portuguese America (Preface, p. ii). Unhappily the noble scholar was surprised by death before he had time to fulfill the engagements which he here assumed to the public. After his decease there was added by his son in April, 1796, a fourth volume, in which Dr. Robertson relates the history of Virginia to the year 1688, and of New England to the year 1652. There the enterprise was left incomplete. The tenth edition which Col. Brown was kind enough to place at my service, bears the date London 1803. As will be seen from the facts that have been instanced, none of the editions that appeared prior to the year 1796 had anything to communicate regarding that portion of North America which lies to the northward of Mexico; they were also confined to the three volumes in which the first edition appeared. observation most familiar, and it occasioned so many difficulties, as to render it somewhat doubtful whether he was indeed the man who was wanted. But the light supplied by Dr. Robertson, removes these obstacles; it becomes apparent that Mr. Spaulding was one of the persons, who are rarely acquainted with things he may see with his own eyes, and hence was afraid to vary much from the authority which lay before him on the printed page. He had likely been made aware of the fact that the "Five Nations" once inhabited the district around Cherry Valley N.Y. where he had kept a shop for the vending of country fabrics, and he does venture upon several allusions to the great lakes, but they are surprisingly timid and obscure (Alma 50:29; Helaman 3:4). contend that they are descended from some remnant of the antediluvian inhabitants of the earth, who survived the deluge which swept away the greatest part of the human species in the days of Noah; and preposterously suppose rude, uncivilized tribes, scattered over an uncivilized continent, to be the most ancient people on the earth. There is hardly any nation from the north to the south pole, to which some antiquary in the extravagance of conjecture, has not ascribed the honor of peopling America. The Jews, the Canaanites, the Phoenicians, the Carthagenians, the Greeks, the Scythians in ancient times, are supposed to have settled in this western world. The Chinese, the Swedes, the Norwegians, the Welsh, the Spaniards are said to have sent colonies thither in later ages, at different periods and on various occasions." accident towards the American coast, and have given a beginning to population in that desolate continent." "The trunk referred to by the widow, was subsequently examined, and found to contain only a single M.S. book of Spaulding's handwriting, containing about one quire of paper. This is a romance, purporting to have been translated from the Latin, found on 24 rolls of parchment in a cave on Conneaut Creek, but written in a modern style, and giving a fabulous account of a ship's being driven upon the American coast, while proceeding from Rome to Britain, a short time previous to the Christian era, this country being then inhabited by Indians". latest effort of his invention, where he recurs to a Jewish origin in the case of the Indians. Few things can be more immoral and corrupting than to personally observe how the Lamanite portion of the Jewish colonies throve on a diet of filth and iniquity while the Nephites, who had all the purity of the nation, and its best promises, were cut off root and branch. Another, and it may be more direct allusion to the "History of America," is believed to be exhibited at Mormon 4:14, where the discourse relates to one of the campaigns of the Lamanites: "And they did also march forward against the city Teancum, and did drive the inhabitants forth out of her, and did take away many prisoners, both women and children, and did offer them up as sacrifices unto their idols." A few verses farther on (v. 21), when describing the capture of the city of Boaz by the same parties, the narrative adds, "their women and their children were again sacrificed unto idols" (cf. Mormon 5:15). in what was hardly less grievous, the noise of their barbarous triumph, and of the horrid festival with which they celebrated their victory. Every quarter of the city was illuminated; the great temple shone with such peculiar splendor, that the Spaniards could plainly see the people in motion, and the priests busy in hastening the preparations for the deaths of the prisoners. Through the gloom they fancied that they discerned their companions by the whiteness of their skins, as they were stripped naked and compelled to dance before the image of the god to whom they were to be offered. They heard the shrieks of those who were sacrificed, and thought they could distinguish each unhappy victim, by the well known sound of his voice. Imagination added to what they really saw or heard, and augmented its horror. The most unfeeling melted into tears of compassion and the stoutest heart trembled at the dreadful spectacle. The circumstance has already received due emphasis that the Book of Mormon knows nothing regarding the Indian population which resided North of the line of Mexico on this continent. It also deserves to be considered that it knows just as little concerning the vast territory of Brazil. That country lay within the latitude of the Lamanites, but all the occurrences related in Lamanite history can be comfortably brought within the limits of Peru, and of such other lands under Spanish government as were situated between Peru and the Isthmus on (his) one hand, and as far down the Atlantic coast as the mouth of the Amazon River on the other. The one single direct reference to Brazil is full of trepidation and doubt. The king of the Lamanites "sent forth a proclamation throughout all the land" (over which he held sway) "amongst all his people who were in all his land, who were in all the regions round about, which was bordering even to the sea, on the east and on the west and which was divided from the land of Zarahemla, by a narrow strip of wilderness, which ran from the sea east, even to the sea west" (Alma 22:27). It is possible that Mr. Spaulding ventured so timidly into the territory of Brazil, for the reason that Dr. Robertson had not yet found opportunity to satisfy the expectation of the public by composing his long promised history of Portuguese America. degrees superior, both as respects the industry, ability and polish it displays to any general history of the New World, which up to that date had left the press. It is possibly also a point out of question that the "History of America", was known at Dartmouth prior to the year 1782, when Spaulding entered its halls. May it not have been recommended to him while there by the favorable comments of the professors, whose instructions he attended, and carried away in his portmanteau, at his graduation in 1785? It was not impossible for him to have preserved a treasure of this amount of consequences through all the sad changes that had shocked and smitten (him on) the voyage of life. In brief it must be concluded that the facts do service toward showing that Mr. Spaulding was almost entirely indebted to Dr. Robertson. The latter composed his work from the point of view of an intelligent foreigner; Mr. Spaulding occupied that of a native Indian historian: He stood on the inside, while the Scotchman stood on the outside, but it would have been a task too large for his powers and improvement to proceed without the Scotchman's aid and direction at every important step.